It is our 3rd birthday and we want to celebrate it with you! Thank you for your loyalty and for showing us that we are a lot the ones who have chosen a zero/less waste and plastic-free life. Thank you for helping us to improve asking for high quality products and service. Thank you for challenging us for more alternatives sharing your needs and advices. Thank you for following us and sharing on our social media. 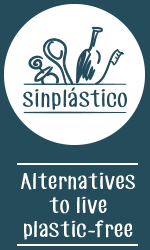 You make the Sinplástico community grow every day. This anniversary is the occasion to celebrate what we have built with you and to go forward for an even bigger and better adventure! *Discount of 15% on the amount of the product. Available for one purchase per person from 07/11/17 to 09/11/17.